The chapter is dedicated to the presentation of methods for conceptual WIS design associated with the conceptual layer of the abstraction layer model from Chapter 1. 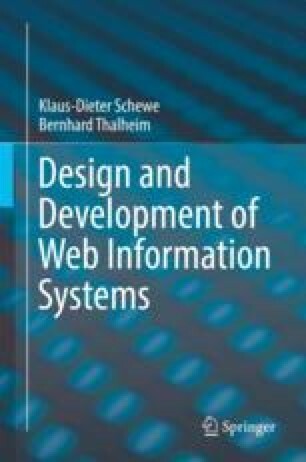 The chapter introduces web interaction types in a step-by-step way starting with views on conceptual database models, by means of which the separation of global and local content is achieved. There is no fixation of a particular database model, but the query language used for the definition of views must be capable to generate identifiers and links. How this can be done is shown in general using algebraic and logical formalisms for querying databases with identifier generation. Interaction types result from views by coupling them with operations including a large set of predefined generic operations. In this way the functionality aspect is injected into the conceptual model. Then extensions with respect to adaptivity and granularity are presented, which lead to web interaction types. The adaptivity extension permits the splitting or aggregation of information to avoid information overload, whereas the granularity extension permits different presentation versions, between which users may switch.